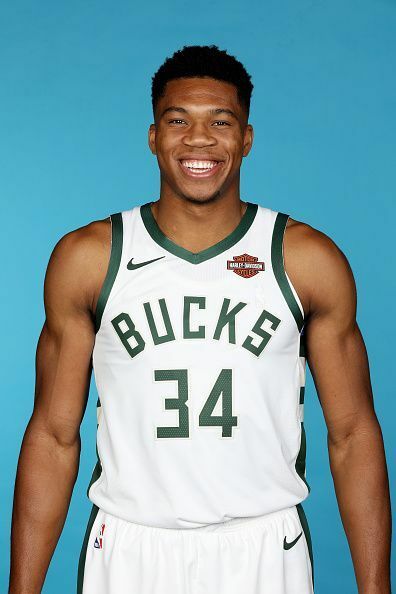 Giannis Antetokounmpo is a Greek professional basketball player for the Milwaukee Bucks of the NBA. he primarily plays as a forward but can also play as a guard due to his excellent ball-handling skills, in fact, He has the ability to play any of the 5 positions, in the 2016-17 NBA season he led his team in all five major statistical categories(points,assists,rebounds,steals, and blocks).His athleticism has earned him the nickname ‘Greek Freak’. He started his professional career by joining the senior squad of Filathlitikos in 2012 and played for them in Greece's second-tier basketball league, the Greek A2 League, during its 2012–13 season, Many clubs across Europe were interested to acquire his services, Spanish club CAI Zaragoza actually signed him for a deal for the 13-14 season but he never played for them as he later declared for the 2013 NBA draft. He was selected 15th overall by the Milwaukee Bucks in the 2013 NBA draft. He had a good rookie season and was named in the NBA All-Rookie 2nd team, He was also selected to participate in the NBA Rising Stars Challenge at NBA All-Star Weekend in New Orleans. On January 19, 2017, Antetokounmpo was named a starter on the Eastern Conference All-Star team for the 2017 NBA All-Star Game. He was also named as the NBA's most improved player for the 2016-17 NBA Season, He became the first international player to get a signature Nike shoe deal, He was chosen in the Eastern Conference All-Star team yet again for the 2017-18, He also became the first international player to be featured on the cover of an NBA 2K game when he was chosen to be on the cover of the NBA 2K19 Standard edition.